Painted in what appears to be an expressionist style, this beautiful artwork is from Deviant Artist LazyPerson202. Such a colourful piece if I don’t say so myself. Would really make any Sonic fan smile! Now here’s an hilarious video from Dorkly, this time delving into the ongoing pet peeve of naming game characters based on titles of the game. Poor Zelda, ah I mean Link! Do you find yourself in need of a store on Etsy which is pretty much one-stop for all knickknacks dedicated to the classic days of gaming? Then look no further, as Etsy Store 8bit Classics delivers. 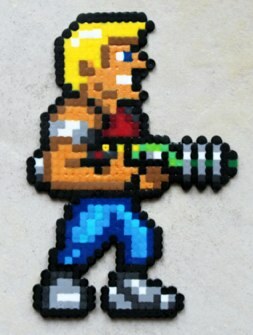 Take this Duke Nukem fridge magnet for example! And finally, over on Vimeo, Punga is showcasing a promotional video he made for a TV channel in Italy called Fox Retro. It’s dedicated to classic TV shows from the 70’s, 80’s and 90’s.